"What got into you?" Cohen Media has debuted the official US trailer for Asghar Farhadi's latest film, a drama called The Salesman, which first premiered at the Cannes Film Festival a few months ago. The title is in reference to many aspects of the plot, but also specifically Arthur Miller's play "Death of a Salesman" which is being performed on stage in the film. That performance is the framework of the film, which actually tells the story of a couple whose relationship begins to turn sour after an incident with his wife home alone. Shahab Hosseini and Taraneh Alidoosti star. I saw this in Cannes and enjoyed it, saying in my review it's "a thoroughly engaging morality tale that proves once again just how talented of a storyteller Farhadi is." After their old flat becomes damaged, Emad (Shahab Hosseini) and Rana (Taraneh Alidoosti), a young couple living in Tehran, are forced to move into a new apartment. Eventually, an incident linked to the previous tenant of their new home dramatically changes the couple's life. 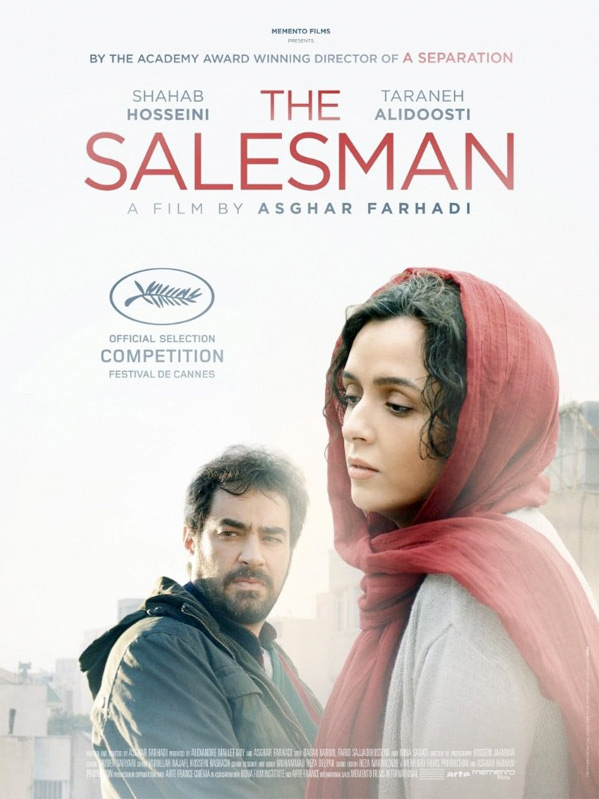 The Salesman (or Forushande) is both written and directed by prominent Iranian filmmaker Asghar Farhadi, of many acclaimed films previously including About Elly, A Separation (which was nominated for Best Screenplay in 2011), and The Past. The film first premiered at the Cannes Film Festival this year (read my positive review). Cohen Media Group will release Asghar Farhadi's The Salesman in select theaters starting January 27th early next year. Looks terrific. When it all comes together, it is a wonderful thing. Iranian are great when it comes to drama. I loved A separation.